Sable is a feral cat who grew up in the forest. Fortunately for her, she is part of a colony of feral cats under the care of TinyKittens. These cats are regularly fed, spayed and neutered and returned to their colony as part of a TNR (trap-neuter-return) policy, and those who require medical care are trapped and taken to the vet for treatment and later returned to the colony. I have written earlier about the groundbreaking project Shelly Roche, of the TinyKittens webcam on Livestream, initiated for the pregnant ferals. She has been trapping them while pregnant, having the kittens born in a safe environment at TinyKittens HQ, providing medical care when required, and socializing the kittens so they do not grow up feral and can be adopted into good homes. The mothers are spayed and returned to the colony. When Shelly saw that Sable was pregnant, she trapped her and brought her home. On Thursday she gave birth to four kittens. I watched the birth live on the webcam and was happy to see that the kittens would be easy to distinguish: classic ginger, tabby, tortie, mackerel ginger. It soon became apparent that the second-born kitten, the tabby named Cindy Lou Mew, was not nursing on her own, and Shelly took her out for bottle feeding. Cindy Lou's back feet were bent, and Shelly gently stretched them back to their natural position. But this was not the only problem. She made a clicking sound, and her breathing was irregular. She would take a few breaths and then stop for a few seconds, like sleep apnea, but not only during sleep. The vet, Dr. Ferguson of Mountain View Veterinary Hospital, performed an x-ray using the mouse setting (newborn kittens are as small as a mouse), and established that Cindy Lou seemed to have all her organs and didn't have any liquid in her lungs, but it wasn't clear what was causing her problems. For three days and nights Shelly and expert vet tech (= vet nurse) Gwen bottle-fed Cindy Lou every two hours. She fed and gained a little weight, and even purred a bit. But as time passed and there was no real improvement, it became evident that she would not develop normally. In order to prevent future suffering, last night Shelly and Dr. Ferguson took the painful decision to euthanise her. Cindy Lou would have died of starvation with great suffering within hours of her birth had she been born in the wild. In her short life she received loving care, was kept warm and fed, and spent some time with her mother and siblings in between the bottle feedings. She had a better experience in her brief time on earth than would have happened in nature. 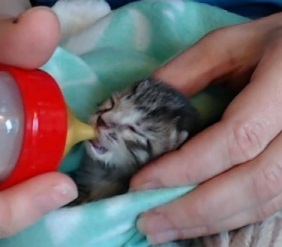 During her three and a half days of life she was watched on the Livestream kitten cam by over two thousand viewers, who all came to care deeply about her. No matter how we tell ourselves not to get too attached, that is exactly what we do. Over the days, some viewers remained hopeful while others warned that it was more realistic to accept the possibility that her life would be short. Sadly, the realists were proven right. The experience of watching Cindy Lou's life raises some questions. What is the value of a cat's life? Why should we humans invest so much effort and emotion in trying to save a cat? How can we decide what is best for a cat? Shelly and her group of volunteers and her viewers believe that every cat's life is worth living. The human race is collectively responsible for the evolution of the domestic cat from wild cat species, and while feral cats do live in the wild, they are not necessarily ideally adapted to this way of life. Some of the feral cats Shelly has brought home for medical treatment ended up undergoing rapid and very impressive socialization, and have been adopted as pets. Feral cats are closer to our domesticated pets than to any wild species, and it is just circumstances that have led to them being born in the wild. This is why the term "community cats" has been introduced to describe the colonies of feral cats living in and near our human communities. They deserve just as much love and care as any indoor pet. Decisions about euthanasia are always painful. The guidelines, in my opinion, are quite clear. Cats should be kept alive if they can have a happy, relatively healthy and painless life. If they are suffering, and the suffering is temporary, it is worth trying to save them in the hope of future happiness. If they are suffering and this is expected to be permanent, the suffering should be ended, no matter how hard it is for us humans to say goodbye. Cindy Lou was not expected to have a happy and healthy life, and it was likely that her condition would deteriorate into suffering. One of the main lessons we can take away from Cindy Lou's life and death is that spaying and neutering cats, both pets and ferals, is essential in order to prevent unwanted kittens being born and suffering. They estimate that only one out of four kittens born in the wild survives to the age of six months. I can support this figure from my observations of feral cats where I live. I have often seen whole litters disappear. Kittens born in the wild can die of starvation, congenital conditions, disease, attacks by predators (including other cats), and traffic accidents. As part of our collective responsibility to cats as a species, it behooves us to prevent such suffering, to support local TNR projects, of course to spay and neuter our own pets, and to try to improve the public's perception of feral or community cats. Watch Sable and her three remaining kittens on TinyKittens Livestream. Learn about the feral cats. [Alternatively, support a local no-kill shelter in your local area]. I am with Shelly, in that every cat's life is worth living, but having gone through the other side I am with Dr F in understanding when enough is enough. Beautifully said and a tribute to Shelly, Dr. F., Cindy Lou and the entire TK team. I not only support TinyKittens, but also my local no kill rescues from whom I have adopted. What a wonderful legacy for Cindy Lou, to bring awareness to the feral situation and encourage spaying and neutering. This says it all! Thank you for taking the time to write this up. Such a moving story. Truly, we have an obligation as human beings to be the caretakers of these wonderful creatures. All cats have value!